Fig. 1-2. Organizations and People that Play Key Roles In Space Missions. 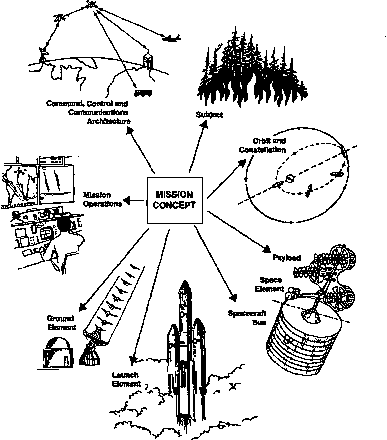 During concept exploration users and operators provide requirements, developers create the design of the mission and systems, while sponsors provide funding. At the Program Initiation milestone, the funding organization commits to proceeding through concept development. The program will receive different levels of scrutiny depending on its scope, political interest, and funding requirements. In DoD, programs classed as major programs receive the utmost attention at the highest levels of the Defense Department. Various components of the military use distinct criteria to identify major programs [Defense Systems Management College, 1990]. A DoD critical requirements program is "major" if it requires more than $200 million in research, development, test, and evaluation funds or more than $1 billion in production costs. Programs that require participation by more than one component of the armed forces or have congressional interest may also be classified as major programs. 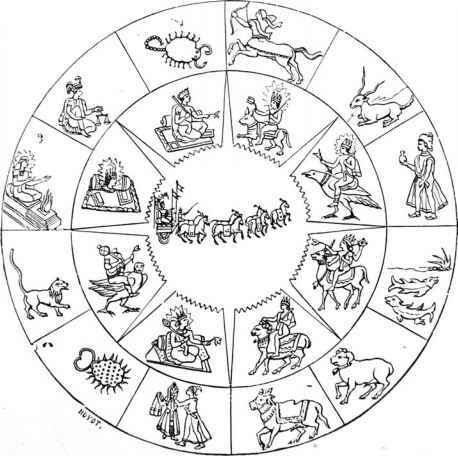 TABLE 1-3. Further Breakdown of Concept Exploration Phase. 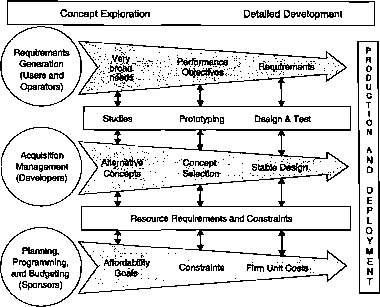 During concept exploration the operator and end users define their needs and requirements and pass them to the developing organization for concept development A basic premise of this book is that the operator, user, and developer should work together to create realistic and affordable mission objectives and requirements that meet user needs. estimating the factors shown in the right-hand column of Table 1-3. The information becomes part of an overall system concept High-level managers in the user, operator, and development communities evaluate whether the concepts, initial mission objectives, and potential requirements meet the mission's intentions. If the program satisfies the need at a reasonable cost, it passes the Requirements Validation milestone and proceeds into the Detailed Development Phase. To explore a concept successfully, we most remove the walls between the sponsor, space operators, users or customers, and developers and become a team. All space missions consist of a set of elements or components as shown in Fig. 1-3. The arrangement of these elements form a space mission architecture. Various organizations and programs define their mission elements differently, although all of the elements are normally present in any space mission. Fig. 1-3. Space Mission Architecture. All space missions include these basic elements to some degree. See text for definitions. Requirements for the system flow from the operator, end user, and developer and are allocated to the various mission elements. what part of the electromagnetic spectrum to use in order to sense the subject, thus determining the type of sensor as well as payload weight, size, and power. In many missions, we may trade off the subject For example, if we are trying to track a missile during powered flight, the subject could be the rocket body or exhaust plume, or both. For communications and navigation missions the subject is a set of equipment on the Earth or on another spacecraft, including communication terminals, televisions, receiving equipment for GPS navigation, or other user-furnished equipment The key parameters of this equipment characterize the subject for these types of missions. The payload consists of the hardware and software that sense or interact with the subject Typically, we trade off and combine several sensors and experiments to form the payload, which largely determines the mission's cost, complexity, and effectiveness. The subsystems of the spacecraft bus support the payload by providing orbit and attitude maintenance, power, command, telemetry and data handling, structure and rigidity, and temperature control. The payload and spacecraft bus together are called the spacecraft, space segment, or launch vehicle payload. The orbit is the spacecraft's path or trajectory. Typically, there is a separate initial parking orbit, transfer orbit, and final mission orbit There may also be an end-of-life or disposal orbit The mission oibit significantly influences every element of the mission and provides many options for trades in mission architecture. The communications architecture is the arrangement of components which satisfy the mission's communication, command, and control requirements. It depends strongly on the amount and timing requirements of data to be transferred, as well as the number, location, availability, and communicating ability of the space and ground assets. The ground system consists of fixed and mobile ground stations around the globe connected by various data links. They allow us to command and track the spacecraft, receive and process telemetry and mission data, and distribute the information to the operators and users. Mission operations consist of the people, hardware, and software that execute the mission, the mission operations concept, and attendant policies, procedures, and data flows. Finally, the command, control, and communications (C3) architecture contains the spacecraft, communications architecture, ground segment, and mission operations elements.